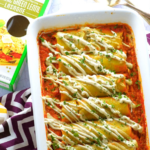 healthy recipes – Get Cooking! A few days ago, my stomach let me know that it was time for a quick lunch break. Since I work from home, I have the luxury of setting my lunch clock internally. I knew I wanted something fresh, healthy, filling, and (since I had plans for a big supper) light in the calorie department. 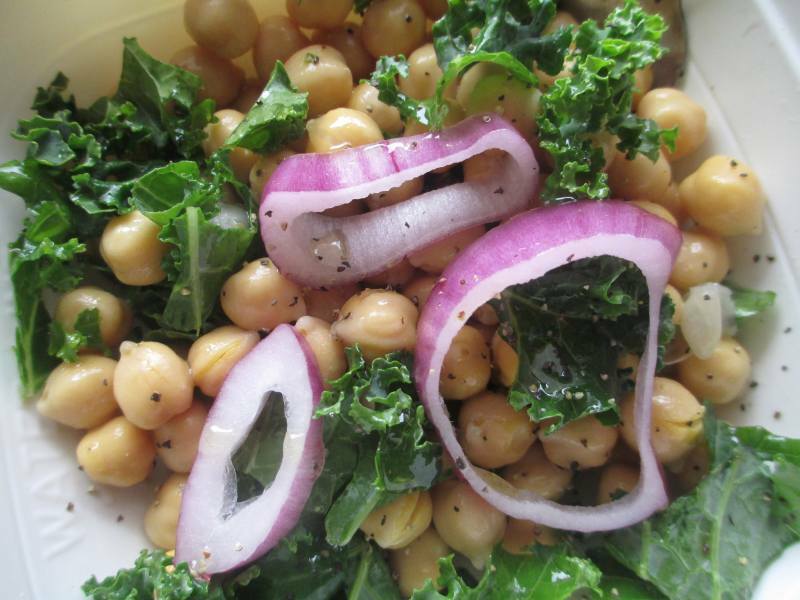 I came up with a Chickpea and Kale Salad that was as delicious and filling as it was healthy. I added a little red onion. Little secret: when no one else is around, I call them purple onions because… well, they aren’t red anymore than I am. They are, however purple. The fact that this is something I take issue with probably tells you everything you need to ever know about me. I’m certifiable… I’ve just yet to be certified. 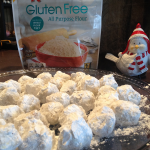 Let your love for each ingredient – and your own personal taste – guide you with the amounts of each ingredient. For that matter, feel free to add to the list. It was darn good, which I pretty much expected because I love each ingredient with a particular passion. However, I honestly didn’t expect it to be so filling. I couldn’t even eat my entire salad. I put a lid on the leftovers and saved it for later. The combination of chickpeas and kale was out of this world. The splash of lemon made it all come together beautifully. Chickpeas are more than just a cute face – although they are pretty darn cute at that. They’re filling, fun to cook with, and have a great flavor. But there’s more. Garbanzo Beans (or Chickpeas) are a great source of fiber and are known to help lower cholesterol and improve blood sugar levels. 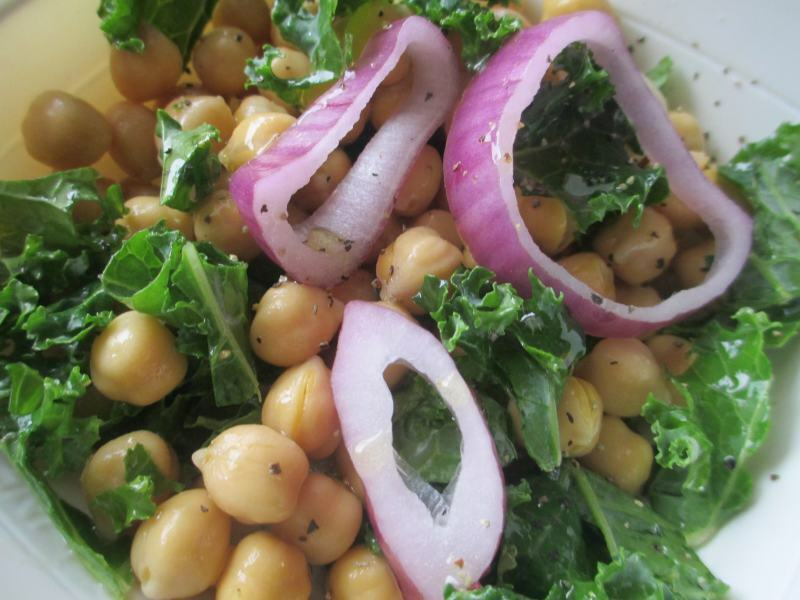 Just 3/4 cup of chickpeas daily can reduce your risk of heart disease by helping to lower LDL (bad) cholesterol levels. Throw chickpeas into tossed, bean, or pasta salads and soups for extra nutritional value, texture, and flavor. Making hummus is another perfect way to enjoy chickpeas. I may be an extreme chickpea fanatic, but I enjoy them as a snack all by themselves. I drain them, rinse them, and pop them in my mouth like popcorn. So good! Kale comes with its own list of health benefits. One cup of kale has zero fat and only about 36 calories, making it a great choice for calorie counters. Best of all, its high in vitamins and antioxidants. The fiber in kale fills you up and lowers cholesterol. The Vitamin C in Kale can help ward off diseases and infections as it strengthens your immune system. The Vitamin C in Kale is also essential for healthy joints. Kale also has Vitamin A which can keep your eyes healthy as you age. Kale actually has more iron than beef! Kale is excellent for healthy skin, hair, and nails – making it a delicious beauty secret. So, Kale can help you lose weight and/or keep it off, fight off diseases, protect your eyesight and joints, build stronger bones AND make you pretty so pretty? What’s not to love? Enjoy Kale in green smoothies, in salads, and soups. One of my favorite ways to prepare kale is a baked kale recipe I found on the Cooking Channel’s website. It’s quick, it’s easy, and it’s awesome. Red.. .ahem… onions (and yellow onions, for that matter) have an impressive list of health benefits, but the one that jumps out at me is their antioxidant power. These onions are some of the best natural sources of quercetin. All you really need to know about quercetin is that it’s a scavenger when it comes to free radicals. Red onions also have cancer-fighting properties which is, all by itself, more than reason enough to include them in as many meals as possible. I love the versatility of red onions, as well as their bright color. I don’t believe I’ve ever had a bad red onion. They’re always just perfect for whatever I ask them to do. You’re probably already familiar with the heart healthy benefits of olive oil and garlic, so I won’t get into their nutritional value right now. Quite frankly, I could be here all day talking about their health benefits because they seemingly go on forever. A final word about eating healthy: When you eat healthy foods regularly, you’ll find that your “junk food” cravings will decrease significantly. I actually find myself craving great salads, soups, vegetables, and fresh fruit these days.. instead of hamburgers, hot dogs, potato chips, doughnuts, and fries. It doesn’t happen overnight, but it does happen. It just makes good sense to eat healthier, doesn’t it? 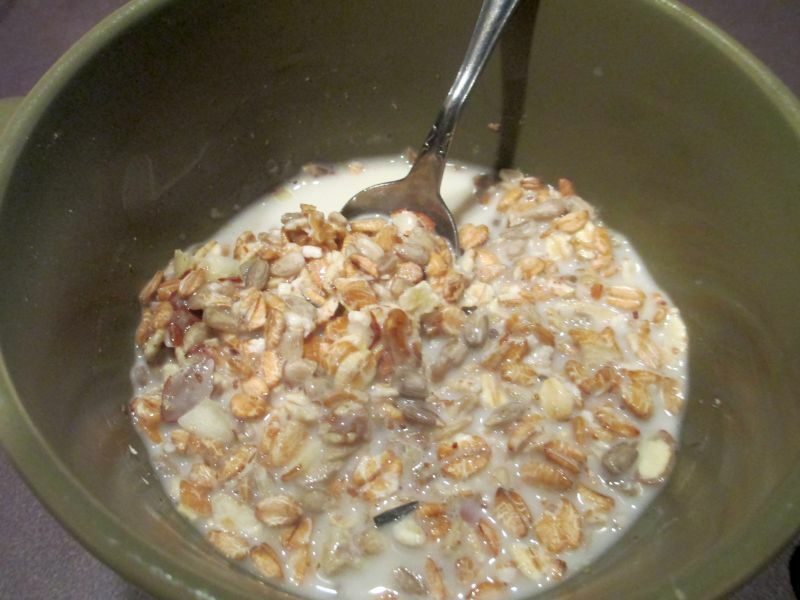 Before I get to the heart of this post… aka a delicious, healthy, and – again – delicious cold whole grain cereal recipe starring Vanilla Almond Milk and Bob’s Red Mill Muesli… I just want to give a little sermon about eating healthy. I promise to make it short. There are a lot of health problems we can prevent simply by putting healthier foods into our bodies. Diabetes, heart disease, and even cancer are monsters none of us wants to ever find on our doorstep. The odds of them showing up (talk about unwelcomed guests!) can be greatly reduced simply by eating healthier foods. I’ve always tried to eat as healthy as I possibly can, and strive to feed my family the healthiest meals possible. Fortunately, there are a lot (and I mean A LOT) of deliciously healthy and healthily delicious foods available these days. Truth be told, healthy tastes better than unhealthy these days. My most recent find is one of my favorites: A delicious cold whole grain cereal made with Bob’s Feed Mill Old Country Style Muesli. On the back of the bag, there are recipes and instructions for hot cereal and for cold cereal. The hot is freaking amazing, but I’ve become somewhat addicted to the cold cereal. I’ve made it with milk, 2 percent milk, coconut milk, almond milk, and apple juice – and it’s wonderful with each and every one. 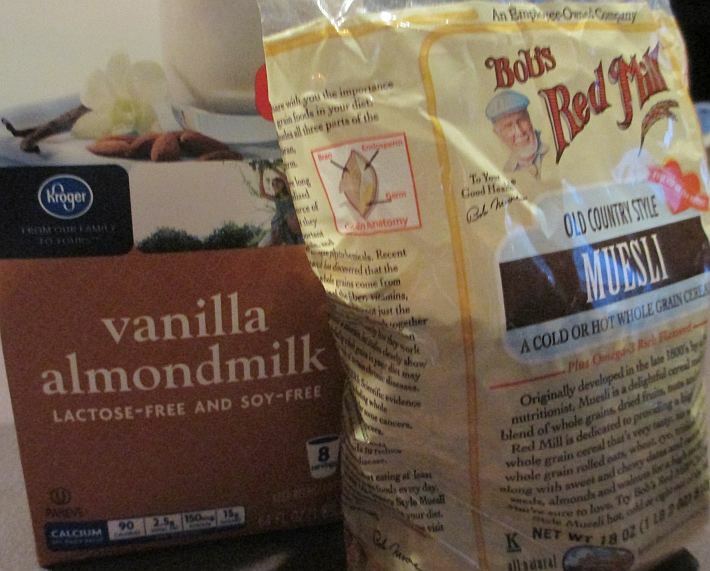 However, when it pairs with Vanilla Almond Milk, it’s simply out of this world fantastic. It’s also STUPID GOOD with vanilla yogurt. I love a bowl at breakfast and have fallen in love with having a bowl before bedtime. If you’re going to have late night snacks (and if you’re like me, you pretty much insist upon it) – they might as well be healthy ones, right? Look in your grocery’s health food section or cereal aisle for this as well as other varieties of Bob’s Red Mill products. I think we’ve tried them all in our house – and have never been anything but blown away. Cold Cereal: Soak 1/4 cup Bob’s Red Mill Muesli in 1/2 cup yogurt, milk, or fruit juice for 5 – 10 minutes (or overnight like the Swiss do) and enjoy. Makes 1 serving. Breakfasts are especially tricky when trying to eat healthier. There are so many unhealthy ways to go wrong. Bob’s Red Mill cereals can help keep you on the right road – the road that leads to better health and a longer life. That’s a road I want to stay on! You can actually buy Bob’s Red Mill Cereal Muesli Old Country Style — 18 oz on Amazon cheaper than in stores. Load up, you’re going to love it. 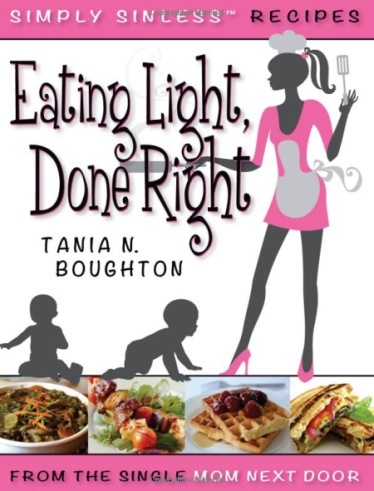 A recent GREAT cookbook I was sent to review is titled Eating Light Done Right by Tania N. Boughton. I can’t tell you how many times I’ve used this cookbook over the past few weeks! It’s absolutely wonderful and I’m all kinds of excited to share a recipe from this cookbook with you. The recipe below is for the healthiest and most delicious scrambled eggs you’ve ever eaten. I’m all about breakfast recipes and this one’s a real keeper. Within the past year, I have had two family members need open heart surgery. Healthy eating is in the forefront of my mind and, given the fact that I consider my readers to be friends, I hope it’s on your mind as well. This is a wonderful book to add to your library. Not only are there tons of delicious and healthy recipes, there are tips and advice that are beyond priceless. Eating right can add years to your life and make your life a whole lot sweeter. Order Eating Light Done Right today! In a small bowl, stir together egg whites, basil, and reduced-fat Parmesan and set aside. In a microwave-safe bowl, mix chopped spinach, tomato mixture, and 1/2 teaspoon of garlic; heat in microwave for about 1 minute. Spray a large nonstick skillet with fat-free cooking spray, heat over medium heat, add egg mixture, and begin to scramble. When eggs are close to cooked, add spinach and tomato mixture and stir until nicely mixed. Remove from heat and serve immediately. I’m not sure there’s a bigger fan of fruit anywhere than me. I simply can’t get enough of this particular food group. My family actually has to keep an eye on me, otherwise I’ll throw fruit into everything from oatmeal and cereal to salads and pasta. When I saw this recipe for Roasted Peach and Nectarine Salad, my eyes nearly popped out of my head. Peaches are a personal favorite, so this recipe had me at “hello.” In all seriousness, everyone should eat more fruit. Fruit is insanely healthy and, let’s face it, if we’re eating fruit, we aren’t eating fatty, fried, sugary alternatives. Getting more fruit into your daily diet is a cinch. Simply have bowls of your favorite fruit handy for snacks. Grapes, cantaloupe, peaches, berries, apples, oranges – they all make delicious snacks. Also, throw your favorite fruit into vanilla yogurt, smoothies, cereal, oatmeal, and even salads. Oranges, peaches, strawberries, and nectarines are excellent in tossed salads. Give the recipe below a try asap and you’ll see what I mean. Preheat oven to 400 degrees. Combine butter, lemon juice, and honey in a small bowl. Microwave on HIGH 90 seconds or until butter is melted. Place peaches and nectarines in a baking dish; pour over butter mixture, tossing to coat. 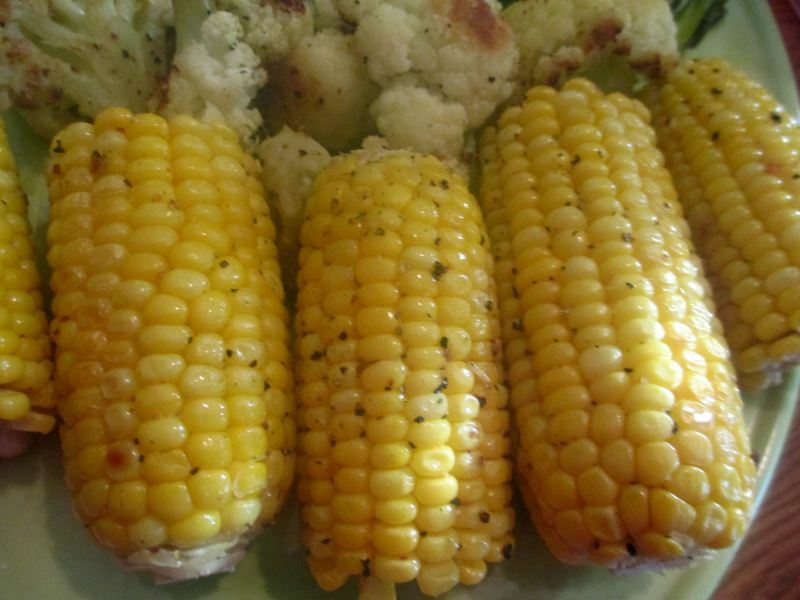 Arrange, cut sides down, in a single layer. Bake at 400 degrees for 15minutes, brushing with juices after 10 minutes. (If the juices begin to burn, add a little water and cover the pan loosely with foil.) Remove from oven, and turn peaches cut sides up. Place a cube of mozzarella cheese in center of each peach and nectarine half. 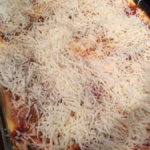 Return to oven, and bake 5 more minutes or until cheese begins to melt. Reserve juices. Toss arugula with olive oil, salt, and pepper. 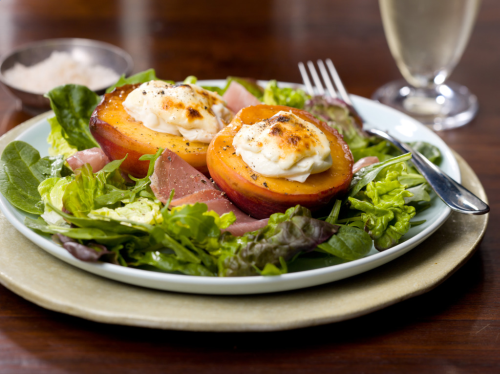 Arrange arugula on a serving platter, and top with prosciutto; top with peaches and nectarines. Drizzle peaches and nectarines with 1 to 2 tablespoons reserved pan juices. 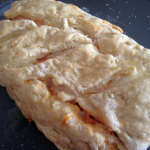 Here’s another beautiful recipe from A Bullseye View! 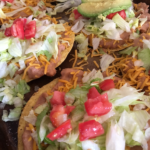 This is a Top Chef Master Marcus Samuelsson recipe…. so, yeah, you know it’s going to be culinary magic. Not only is this a beautiful and delicious recipe, it’s healthy. Omega 3s are as healthy for brain health as they are heart health, and shrimp is a great source. It’s also ridiculously tasty, so have at it! Step 1 – Season shrimp with salt and pepper. Step 2 – Mix yogurt, chili powder, garlic powder and jalapeno in small bowl. Step 3 – Heat olive oil in sauté pan on medium-high heat. Step 4 – Add the shrimp and cook about a minute on each side. 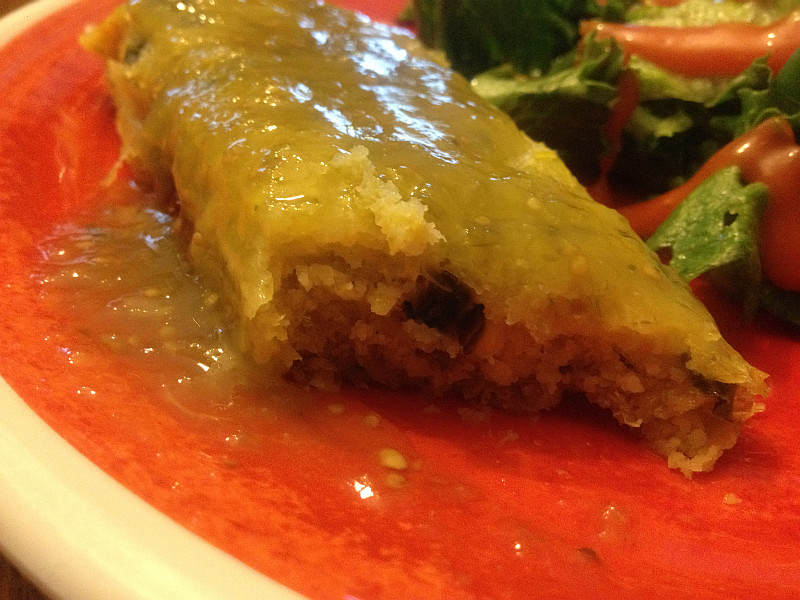 Step 5 – Add the lime juice and remove from heat. Finish with scallions. Step 6 – Stuff each piece of pita with 1/4 of the shrimp and romaine. Drizzle on yogurt sauce, as desired. Today, July 13th, is actually National French Fries Day — a fun way of celebrating how much Americans love fries. Amazingly enough, the average American eats about 29 pounds of fries a year. That’s a heckuva lot of fries! The problem is, fries aren’t exactly the healthiest thing in the world for us to be eating… and eating so much of at that. In honor of National Fry Day and as a way of encouraging healthier eating, Pritikin Longevity Center & Spa is sharing this delectable, 45-calories per serving, recipe for Roasted Potato Wedges with our food blog readers. 2. Soak potato wedges in vinegar and water for about 30 minutes. 3. On a nonstick baking sheet, spread out wedges. Sprinkle with onion and garlic. 4. Bake in oven for about 20 minutes, turning once. 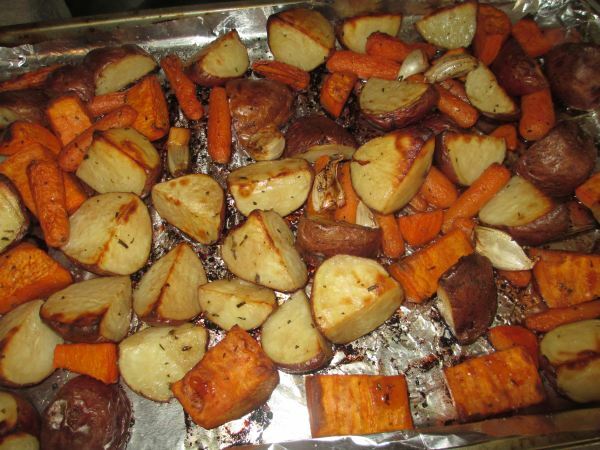 Remove from oven when wedges are crispy on both sides. Nutrition Information (per serving): 45 calories, 0g total fat, 0g saturated fat, 0mg cholesterol, 1g protein, 1g fiber, 0mg sodium. Pritikin Longevity Center + Spa is a brand new, 650-acre fully renovated private wellness spa and weight loss health program. Complete with exceptional fitness trainers, award winning chefs, nutritionists and renowned spa treatments. The center boosts tons of experts from health to nutrition and fitness to spa and wellness. People from all over the world travel to Pritikin to get their health back on track and get their bodies back in shape. For more information, please visit www.pritikin.com. EDIT: I have fallen in love with the Rachael Ray Fancy Boy Grinders pictured below. You can find a few of them in your grocery store (if you’re lucky) but all can be found on Amazon. Let me just pause a second and reiterate how very much I love Amazon. Click the link to see the different varieties on Amazon. Seriously, I’m so hooked on these I can’t even tell you. 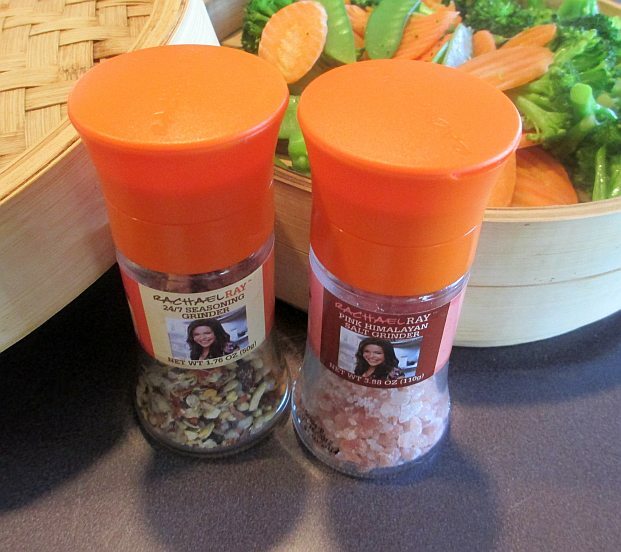 These spice grinders are the bombdiggity! The recipe below is from a favorite cookbook of mine: The Biggest Loser Cookbook: More Than 125 Healthy, Delicious Recipes Adapted from NBC’s Hit Show . As you may know, I’m totally hooked on any and all things associated with The Biggest Loser. I LOVE the show’s premise of changing lives – they literally give these wonderful people a second chance at life and I don’t guess I’ve ever watched an episode without tearing up at least once. I also have their exercise dvds (although a recent one has just about been the end of me!) and every cookbook I can get my hands on. I haven’t bought the newest Biggest Loser Desserts Cookbook yet or the Food and Activity Journal but I will. I’ve looked through them several times at the bookstore. I even committed to memory an Orange Smoothie recipe, went directly to the store for the ingredients (you know, before the memory train rode off into the sunset) and made some that night. Delicious!!! This healthy, low-calorie, and outrageously delicious Spinach recipe was titled “Melinda’s Holiday Spinach” in the cookbook but I’m just going with “Melinda’s Spinach” below. I wouldn’t want anyone thinking you had to wait for Christmas, Easter, Thanksgiving, or any other holiday to make this dish. I actually first made it during the summer – I remember because I was listening to baseball (another obsession) while cooking. Give this one a try, you’re going to love it. Set a large nonstick skillet over medium heat. Add the olive oil. Heat for 30 seconds. Add the onion. Cook, stirring occasionally, for 2 minutes. Add the bell pepper, mushrooms, and garlic. Cook, stirring occasionally, for 5 to 7 minutes, or until the vegetables are tender. Add the spinach. Cook, stirring constantly, for 2 to 3 minutes, or until the leaves are wilted. Remove from the heat. Add the cream cheese. Stir until the cheese melts. Serve immediately. Makes 3 (2/3 cup) servings. The Biggest Loser Cookbook: More Than 125 Healthy, Delicious Recipes Adapted from NBC’s Hit Show is packed with recipes you’ll use again and again. There are healthy breakfast recipes, healthy snack recipes, healthy sides, soups, stews, and even healthy desserts. As a grand #1 snacker, I’m saved by the snacks in this cookbook! My family and I love to snack while watching our favorite tv shows and ballgames. 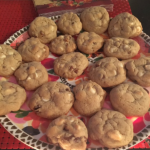 If it weren’t for healthy recipes like these… well, I don’t even want to think about it. I probably wouldn’t be able to fit through my back door. …. and, well… all the rest! I could list a lot more recipes, but quite frankly I’ve worked up an appetite. I’m 2 minutes away from fixing Seth’s Fiesta Poached Eggs for brunch and my mouth’s watering. This really and truly is a wonderful cookbook – and one that you’ll again and again. A lot of cookbooks have less than a handful of recipes you’ll actually use. When it comes to this book, you’d need a team of hands. Plus, we’re talking about ingredients that are easy to find. In fact, a lot of them are probably in your kitchen right now. I love that! The Biggest Loser Cookbook is also packed with inspirational contestant stories and advice from the trainers. If you’ve made a commitment to fitness and to living healthier, you’ll want to arm yourself with all the tools and motivation you can get your hands on. The Biggest Loser cookbooks, books, and dvds are an excellent way to fill your arsenal with tools that’ll help you meet (and surpass) your goals. Also, watching the show each Tuesday night will also give you tons of advice, tips, motivation, and inspiration. Here’s an extra little tip: Follow the trainers and host on Twitter! They’re always sharing tips, advice, motivation, and even recipes. You never know what they’re going to say or do next and they’re excellent at fan interaction. The information is below and your goals are within reach.